The Three Penguins is a short but proud tower located just minutes from Moab. Because of its position on slender rock pedestal, the tower feels taller and more exposed than it is. 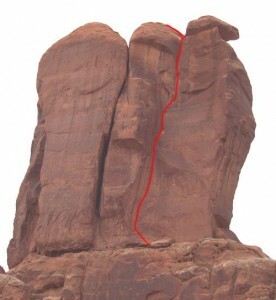 In spite of its name, this route is not a chimney though it does require 20 feet of offwidth climbing at the summit. The rock quality is awesome relative to other Arches routes. The climb starts with tight hands and ends with offwidth and involves and even amount of every size in between. Which SuperTopo guidebooks include a topo for Right Chimney?